Alli McNails: 31 Day Challenge 2014! 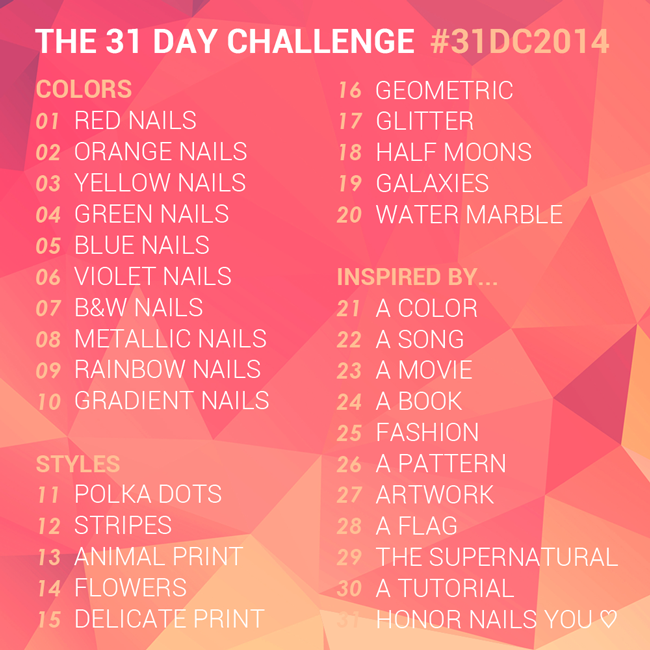 So I’m sure you all have seen and are familiar with the 31 Day Challenges for nails. What better way for me to become more consistent and more creative with my designs that this?? However..they're gonna be spaced out here and there because I have other stuff going on but they'll still be coming. So yea! We’ll see how many good(and bad) ideas I can come up with! I think the one that I'm looking most towards would be day 19 - Galaxies and day 24 - Book. Not so sure about 25- Fashion or 30 - Tutorial. We'll see how that goes. Day 1 will be posted soon!